Now we've got an even bigger roster, and with Nintendo's new alliance with Sega, we finally have Sonic the Hedgehog joining the fight. Rad to the max. We're fast forwarding seven (!!!) years from the previous game. I guess Melee in 2001 was so good that they didn't need to do another one for a while. Then again, the two years between 1999 and 2001 felt pretty long too. Are we sure that years haven't gotten shorter? Back then, a week could feel like an entire Summer. Lots of options here. 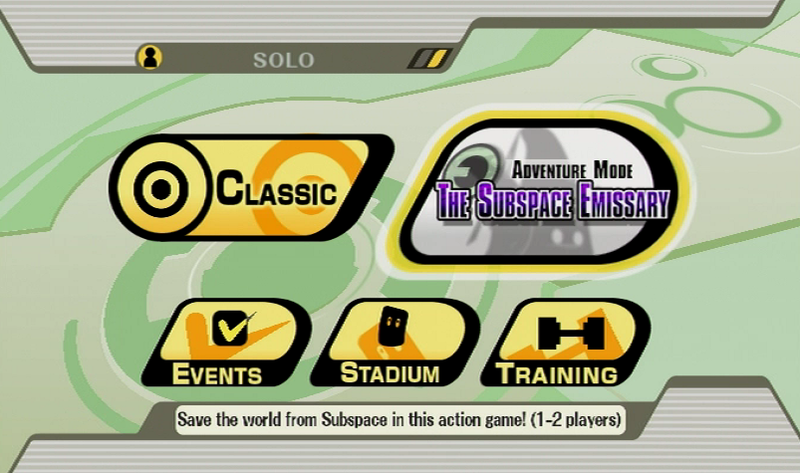 I'll be going through Arcade mode as usual, but the big deal here is Subspace Emissary mode. It's Adventure Mode on 'roids. 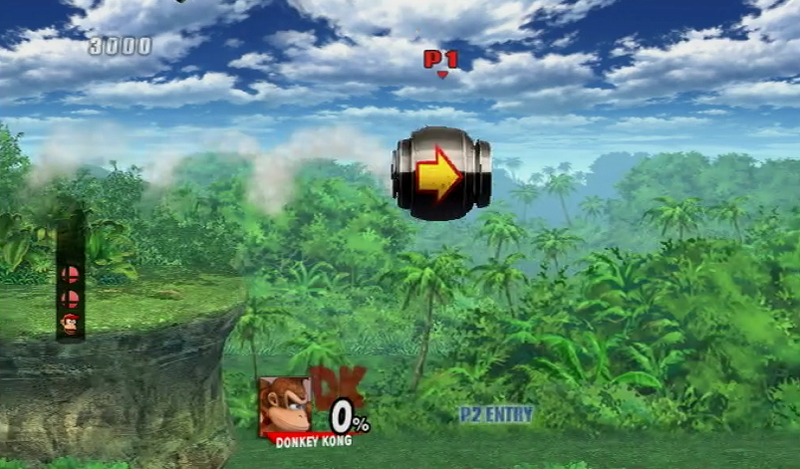 Surprisingly, Sonic isn't unlocked from the get-go. 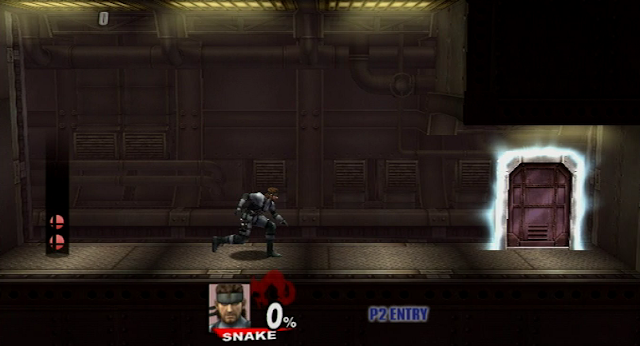 Nor is Solid Snake, another addition that I believe debuted in this game. 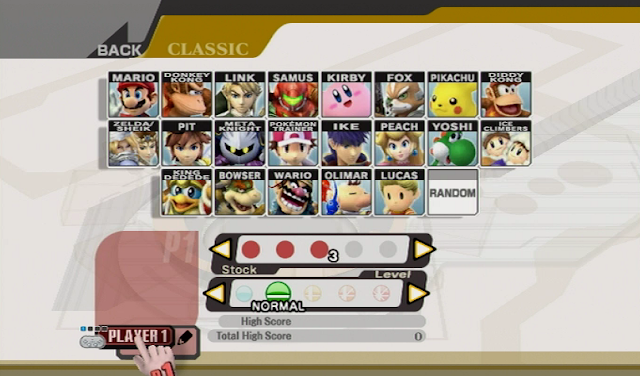 This is the main Smash game that I've played in the past, usually as Ike. 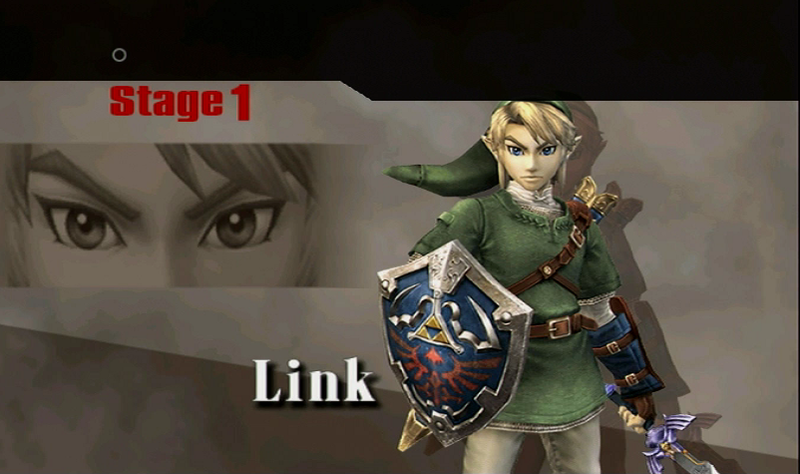 Here's Link, Twilight Princess version. This is where Nintendo finally realized that he wasn't wearing any pants before. NICE background. 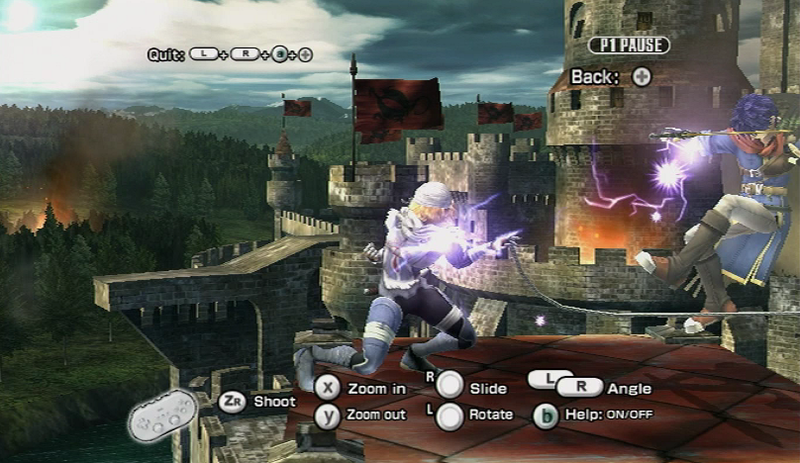 The visuals are a huge step up, even though the Wii technically isn't much more powerful than the Gamecube. This time, pausing gives you even more options for getting a good look at your favorite superstar. And this game DOES have Zero Suit Samus. Pervs rejoice! 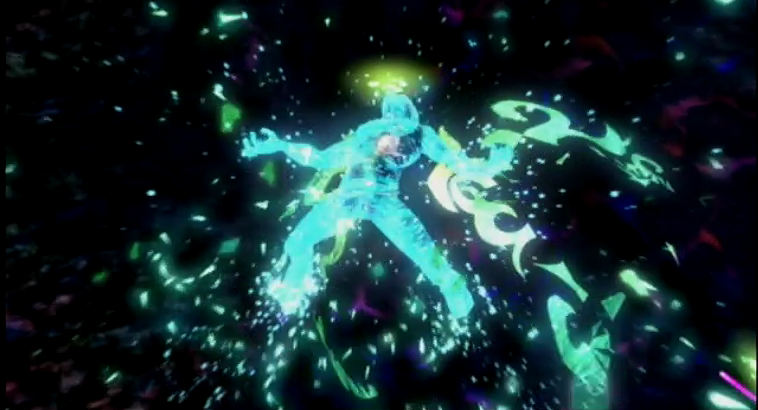 Arcade mode is a series of fights where you fend for yourself against a few CPU opponents. The opposition tends to gang up on you, and ring-outs are your best weapon. In short, it isn't really any different from the arcade mode of other Smash games. The requisite WrestleMania match has the player squaring off with a GIGANTIC PIKACHU...and a regular-sized Squirtle is there too for some reason. Not sure what the deal is. I try out the Sheik variety of Zelda. I was into the Fire Emblem series before I played Smash, so it's pretty cool to see characters from that series with these visuals. Looking forward to Fire Emblem Warriors. Man, this game likes gigantic foes the way the previous games liked "massive numbers of foes". 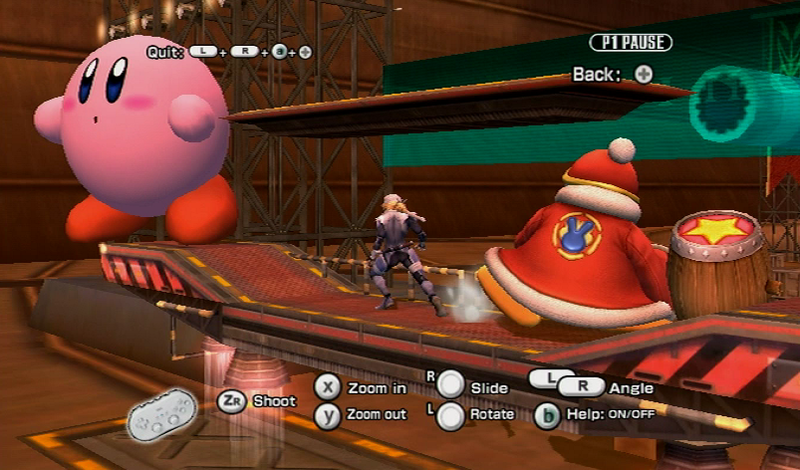 Every other battle is against over-inflated characters. 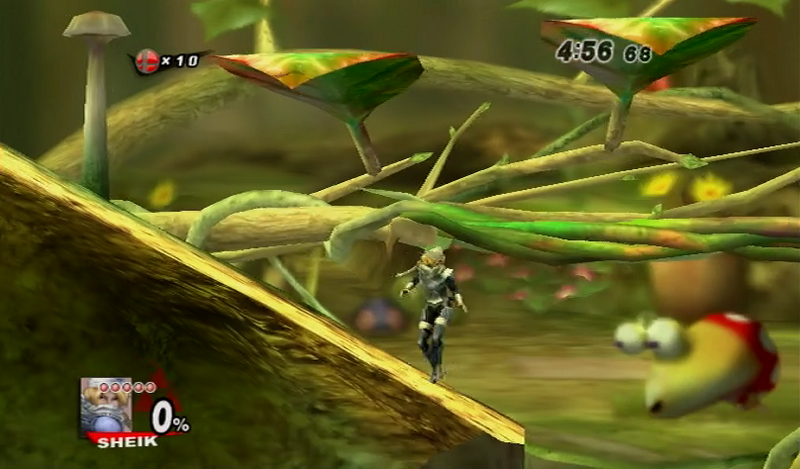 Here's the Pikmin stage. Unfortunately I haven't played Pikmin, so I'm not going to get the references here. I like the "little world" look though. 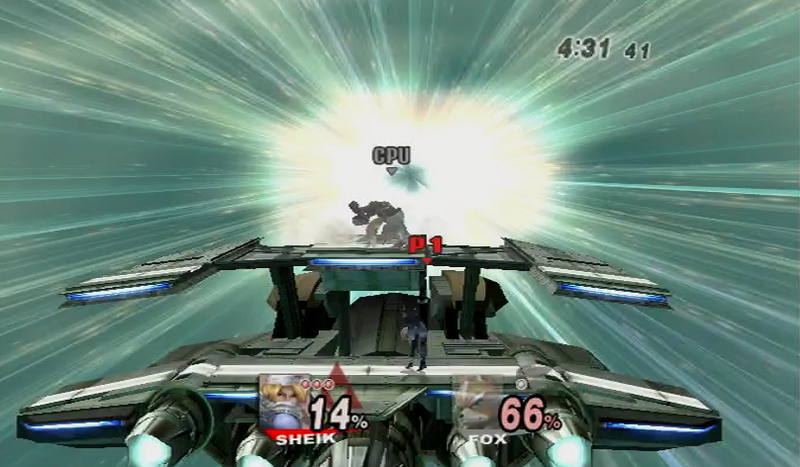 Sheik battles Fox on a moving vehicle! 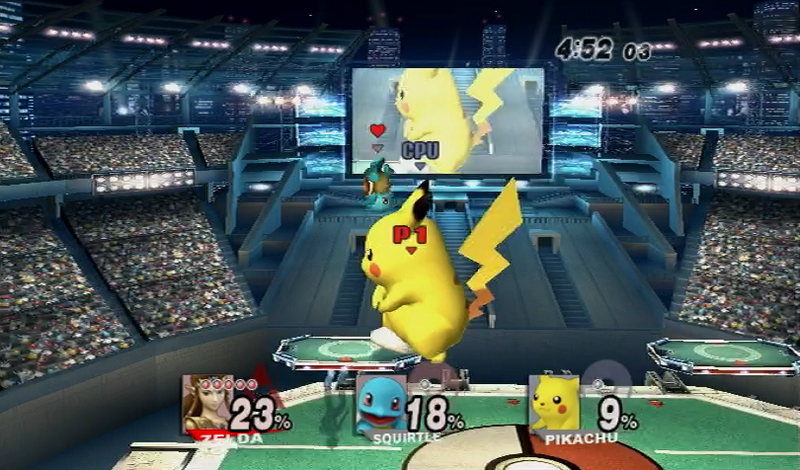 The background makes this look like a Final Smash in a Street Fighter game. Bowser is looking more high-res than ever. Interesting that this game uses the Isle Delfino themes for Mario levels, even though Super Mario Galaxy was out by this point. 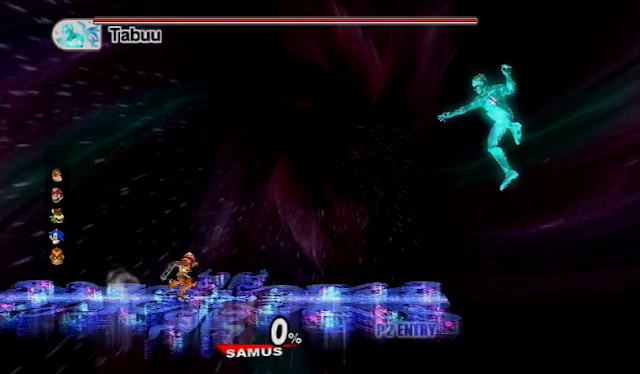 The T-1000 has to make an appearance near the end, and this time he takes the form of Pit. 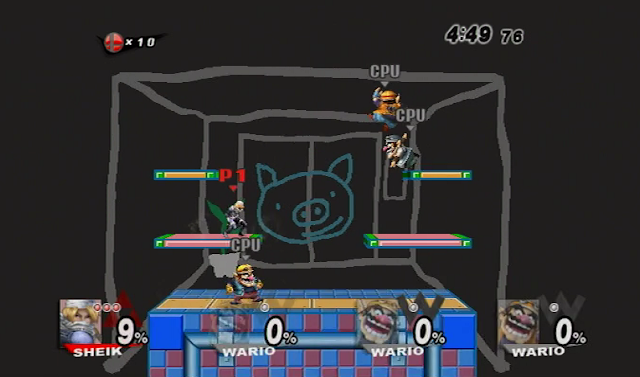 Stage 10 pits me against Team Wario...a squad of Warioes. This stage draws (heh) on the Wario Ware series, with weird crayon backgrounds. Get past the pack of rabid Warioes, and it's...Master Hand, yet again. 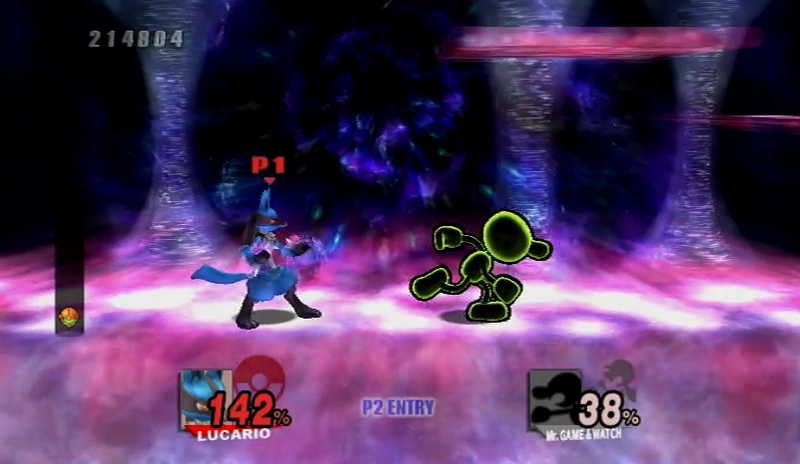 He has the same attacks as ever, and I have the easiest time defeating him yet. Not sure if it's because his stats got lowered to make things easier or because I've gotten better at fighting him...hard to say. Zelda shows Tasteful Sideboob as she strikes the final hit on Master Hand. 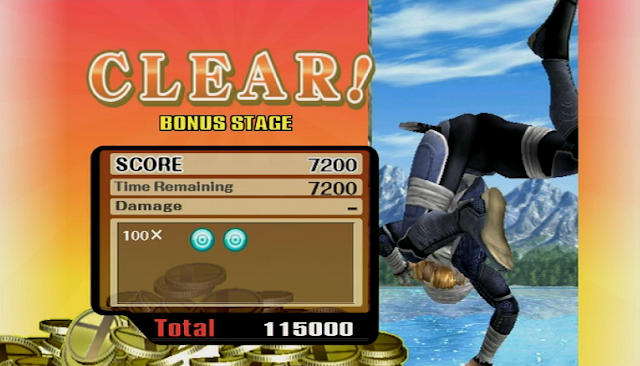 That does it for Arcade Mode. 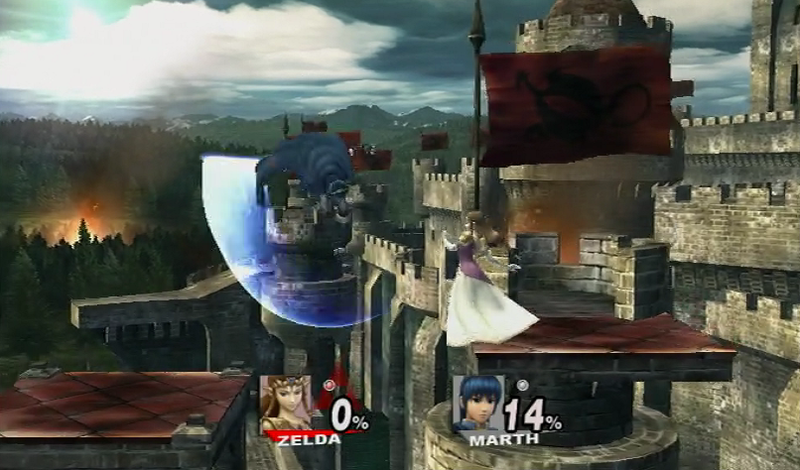 Man, sweet rendering of the Master Sword here. 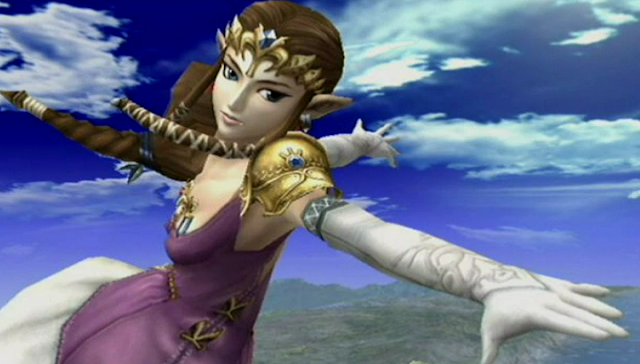 I didn't like Twilight Princess when I played it, but I feel like I didn't give it a fair chance. There was too much wolf-gameplay early on and that soured me on the game even though I'm pretty sure it got a lot better as I progressed. 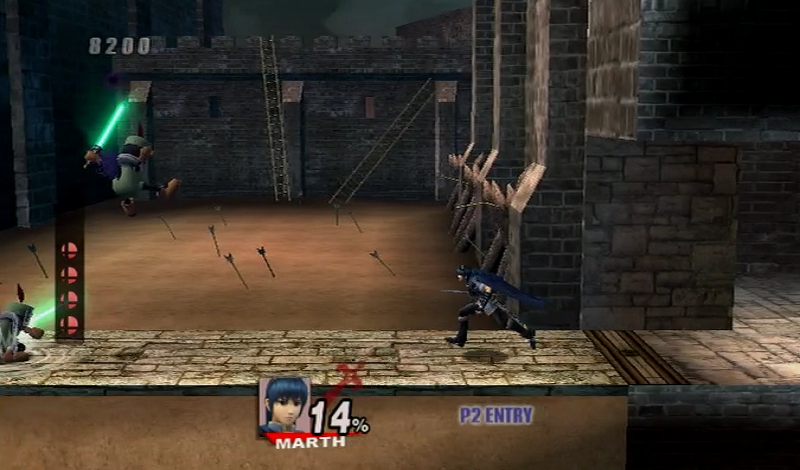 After-credits sequence has me fighting Marth from 'Emblem in an effort to recruit him to the roster. The usual. 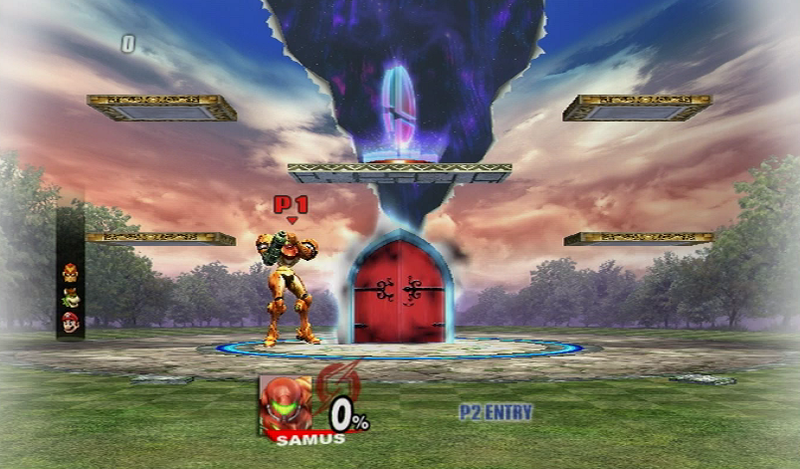 With Arcade Mode out of the way, it's time for Subspace Emissary mode. These difficulty levels sound like they're designed to excite your girlfriend. Subspace Emissary is a full-on story mode with cutscenes and everything. 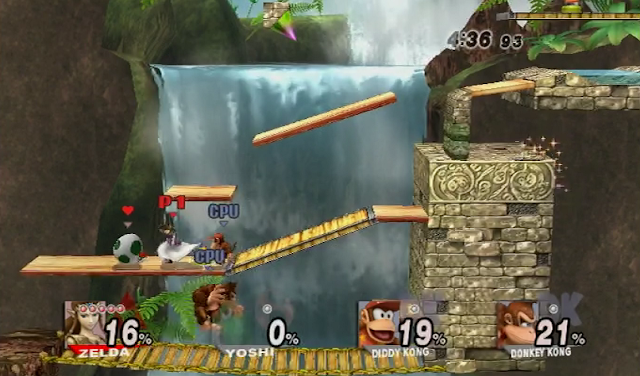 It's at least five times longer than Melee's already-substantial Adventure Mode. 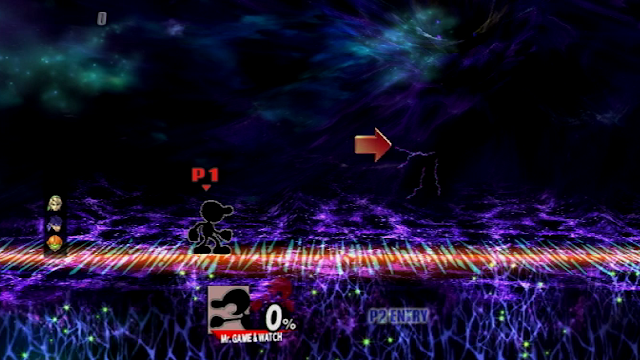 Not going to spoil too much of the story here, but let's take a look at the layout. 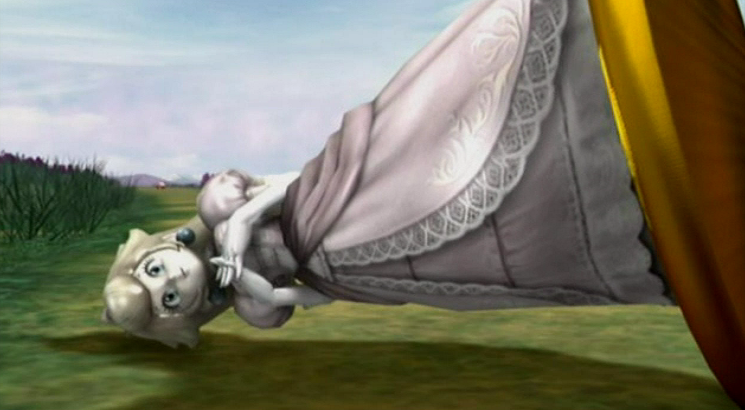 Zelda and Toadstool look like they're from universes with completely different laws of physics. 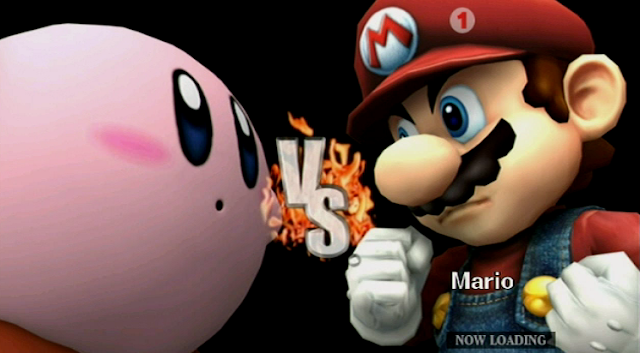 Speaking of different universes...oh boy, this is a big matchup for me. 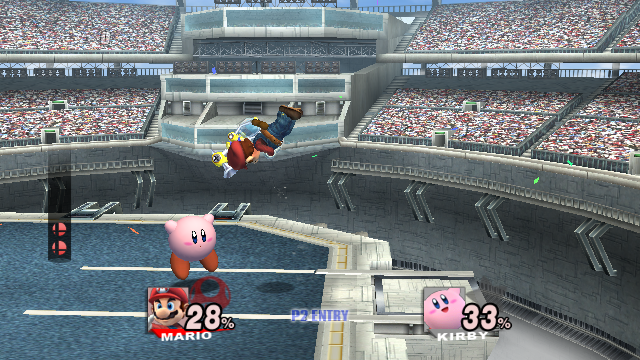 I grew up obsessed with Mario games, but Kirby was the series I tended to actually have. 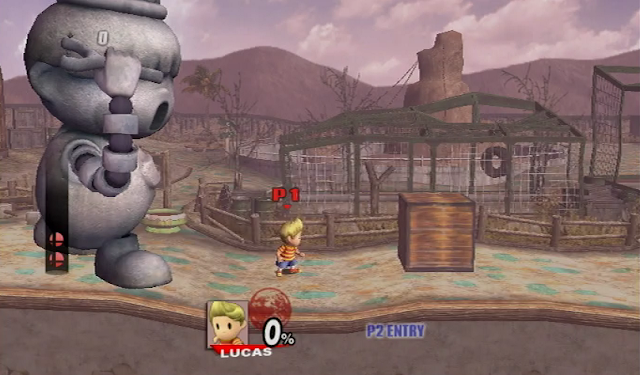 The character models have the "fuzzy-clay" look that a lot of Wii character models have. I don't know how else to describe them. I like this graphical style. It's more appealing than the "shiny mannequin" look that characters in most high-def games have in 2017. 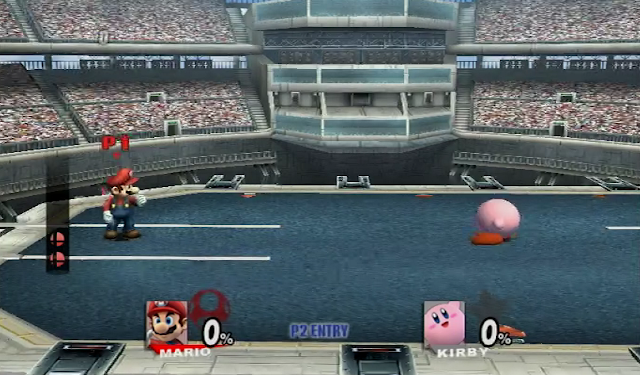 WrestleMania ensues yet again as Mario battles Kirby in front of a sold-out stadium... with no floor. Yep, the pits are just as bad as ever. Well, most players probably don't have the issues with them that I do. 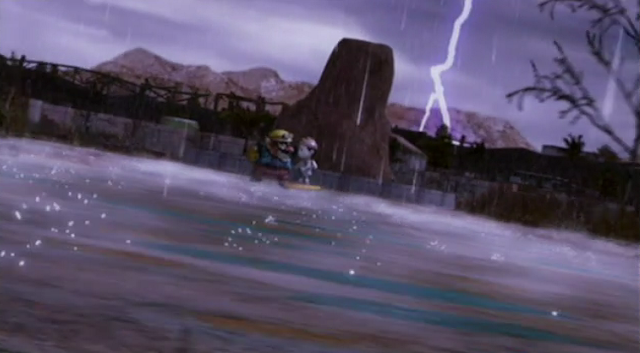 Mario is equipped with the deeply-unpopular FLUDD in this one. 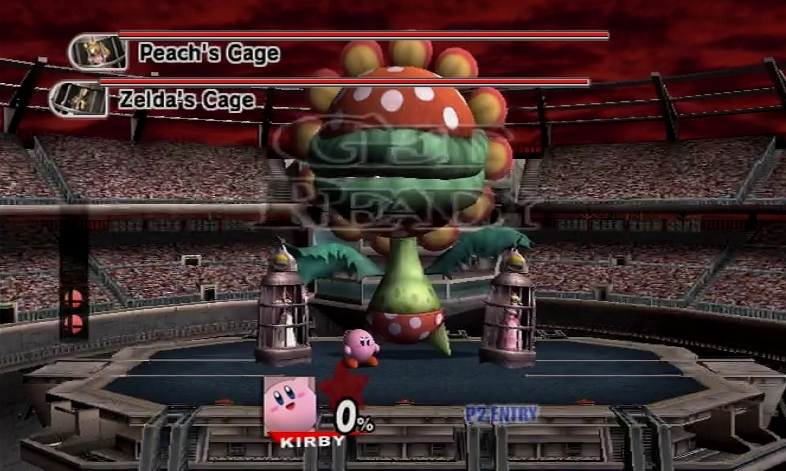 I mean, I liked FLUDD, but the concept seems detested online. 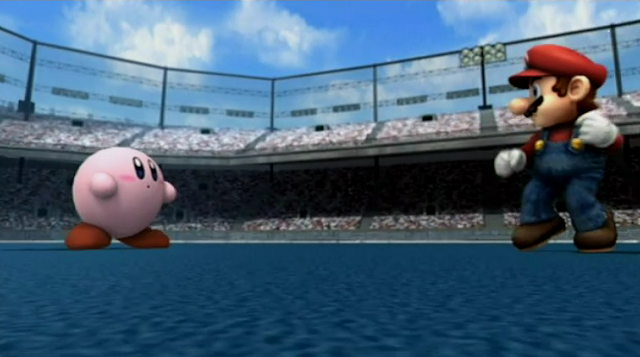 The main event of WrestleMania has Kirby fighting to save the women from the Giant Piranha Plant. 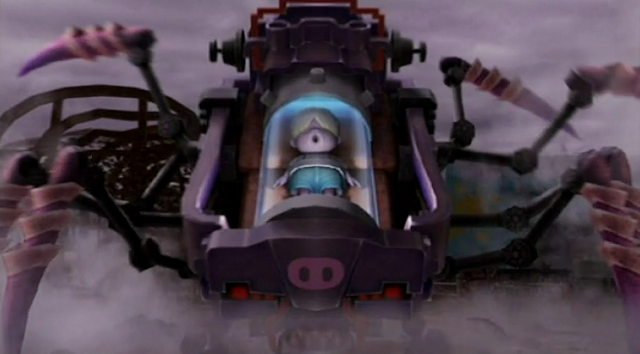 This sorta reminds me of Kano and Sonya being chained-up by Shao Khan. I think you can beat up their cages to free them so they help win the fight, but I didn't try it. Figured there was an equal chance that depleting a cage's HP would kill the character in it, so I avoided hitting them and attacked the plant. 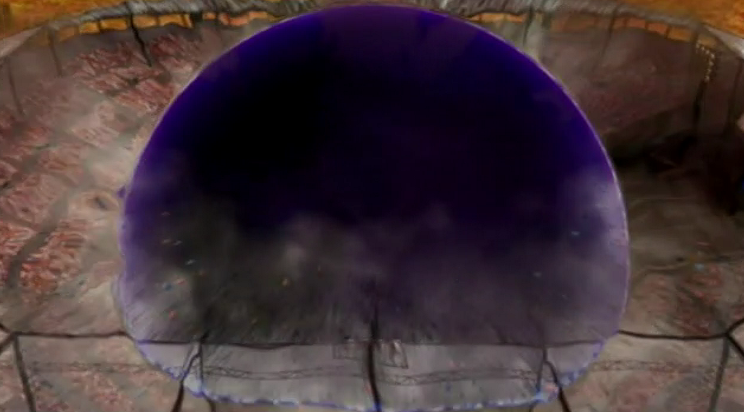 The main thrust of the story here is that unseen bad guys are attacking the kingdom with...giant anti-matter blasts. These aren't just explosions; they disintegrate anything they hit. ...Palutena. Oh My God Yes. 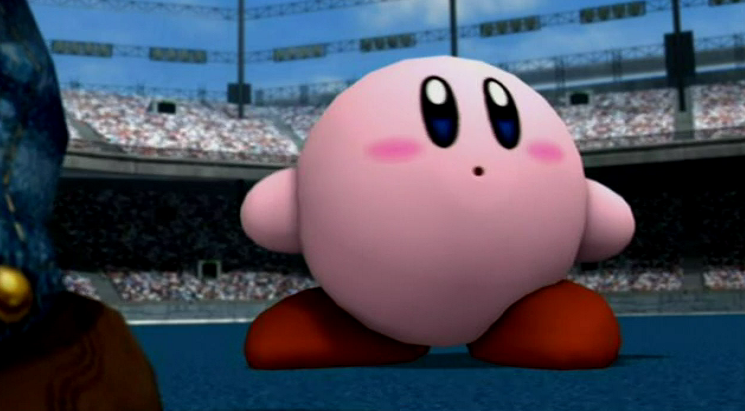 When even Kirby blushes at a Nintendo character, you know things have gotten real. 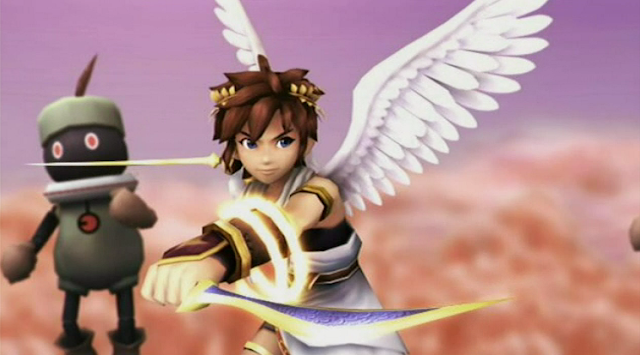 Pit gets equipped with a double-blade. I like these things. 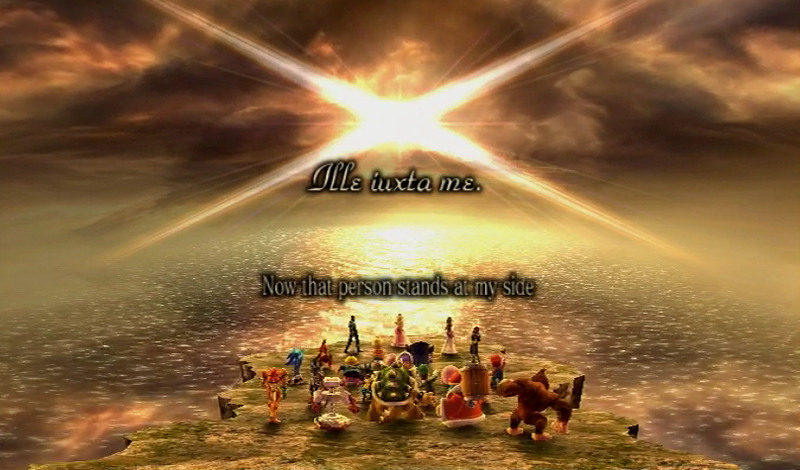 Reminds me of Chrono Cross and Final Fantasy IX. 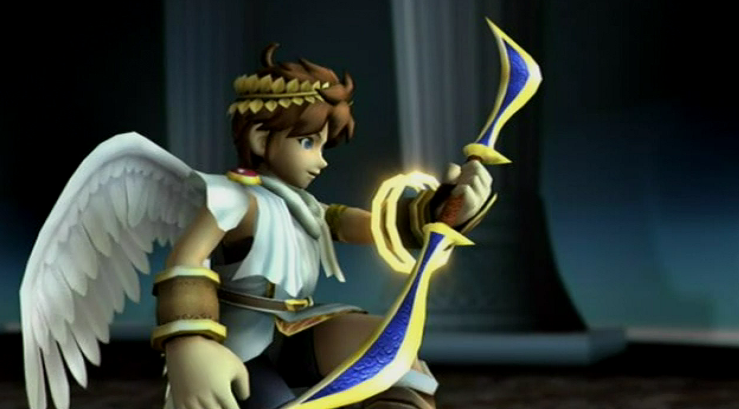 His double-blade can also split into two knives to dual-wield, because he wasn't enough like Zidane. 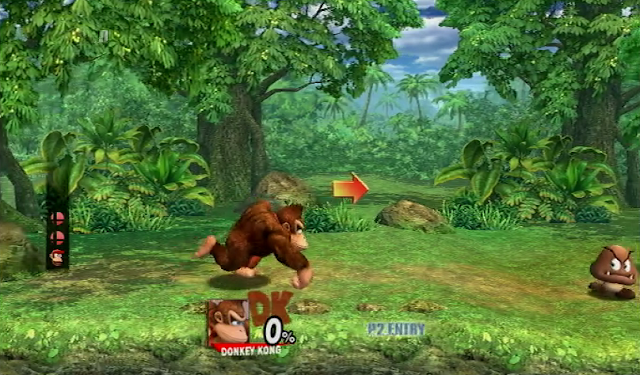 After slashing through some weird puppet enemies, we're onward to the jungle. 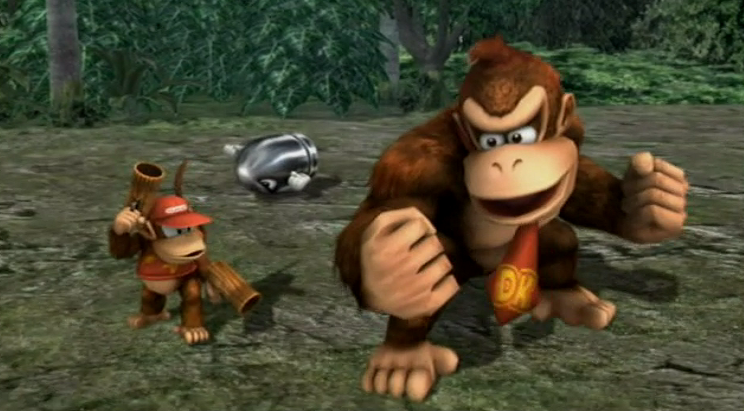 Donkey and Diddy Kong are both in action here, and Diddy is armed with delightfully overpowered guns. This is awesome. We've got remixed Donkey Kong Country music playing and a side-scrolling level where the Kongs battle foes from the Mario world. 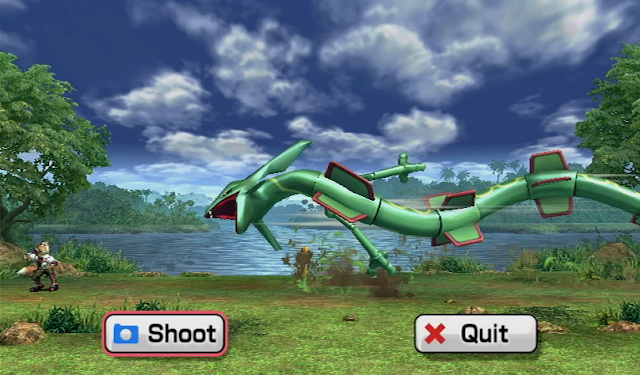 It even has barrel cannons that function the exact same way they do in the Donkey Kong Country series. They don't look right, though. 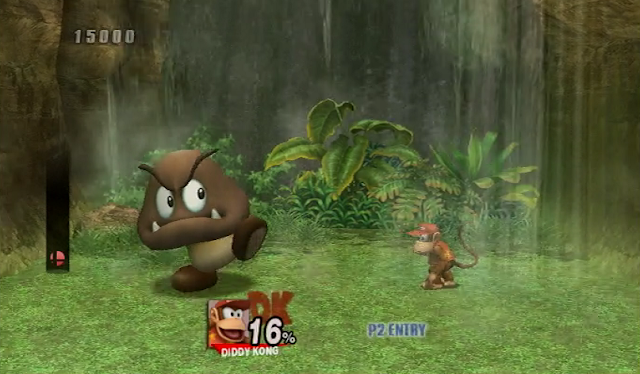 Giant Goomba is the latest oversized foe. There are two things this game likes: Oversized enemies and sweeping, epic-sounding choruses. 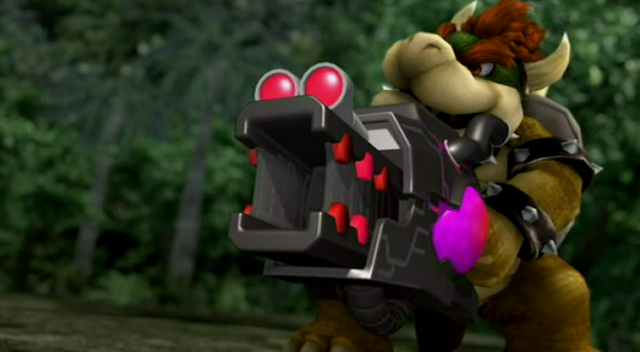 Bowser shows up after that with this BFG that turns people into action figures, capturing Donkey Kong. 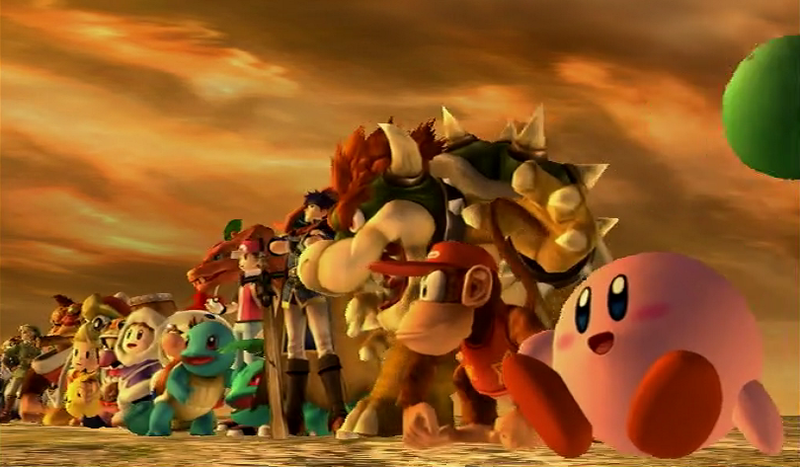 Finally, Bowser doesn't have to share any heat with the other "big man" of the Mario universe. 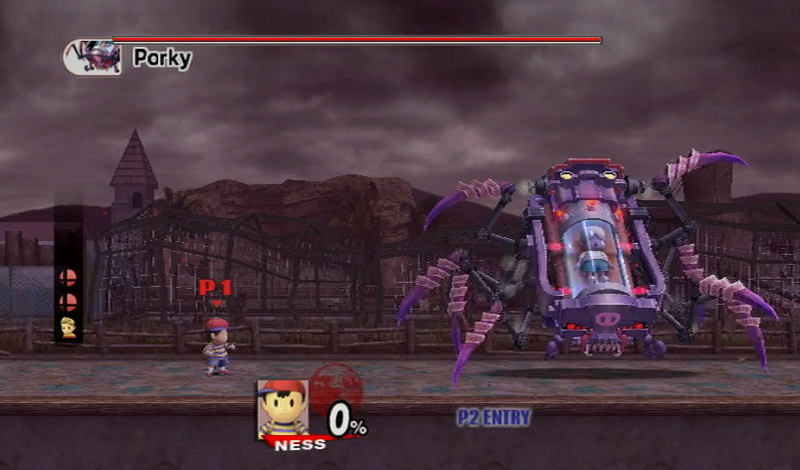 This is the main story of Subspace Emissary: Besides villains from another world dropping antimatter bombs, Bowser is collecting souls via action figure BFG. 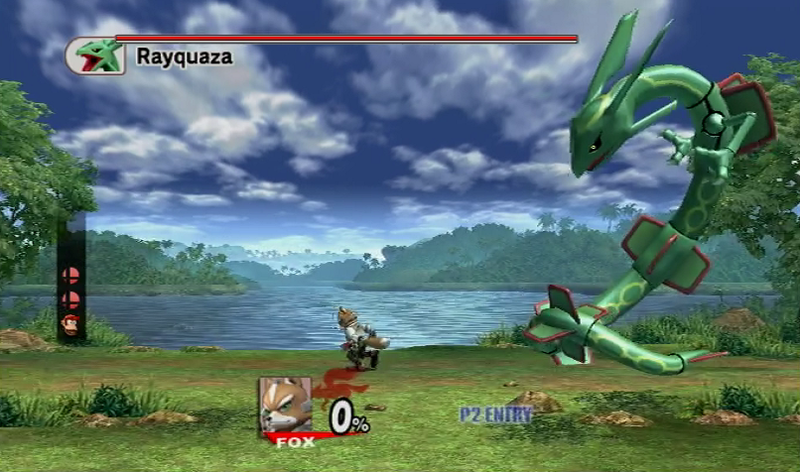 Fox McCloud battles Rayquaza, legendary Pokémon. This is a tough boss fight, one that Sephiroth would have on a pike within 30 seconds if he were playable yet. Rayquaza executes a Psycho Crusher! 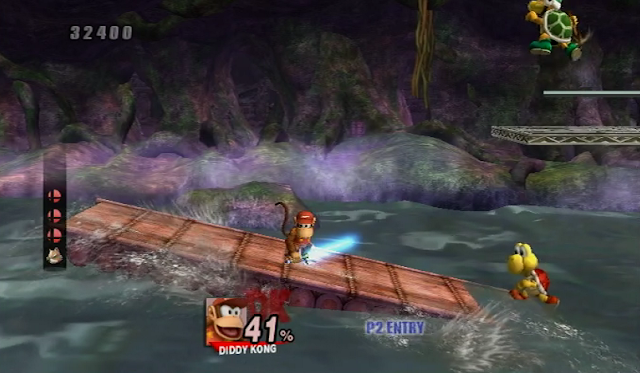 Diddy rides a raft across what looks like the River Styx. This is a good time to show off the lightsaber powerup, though. Even though the game doesn't have Star Wars characters (that I know of), one of the many sub-weapons that drop throughout the game is a sweet lightsaber. 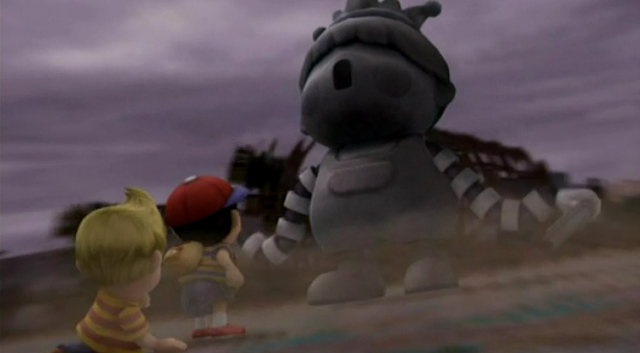 Next, we head for the world of Mother 3. 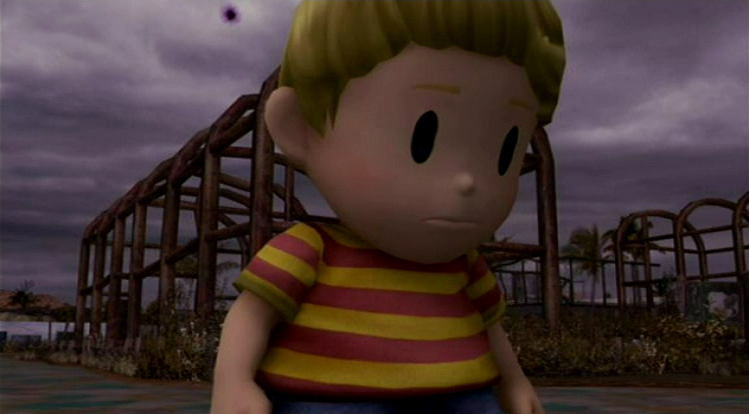 Here's Lucas, the forlorn boy-hero. He's in the rotting apocalyptic wasteland, alone. If that wasn't bad enough, a giant stone Pokey chases him through some ruins as he flees for his life. What is this nightmare fuel? But wait! 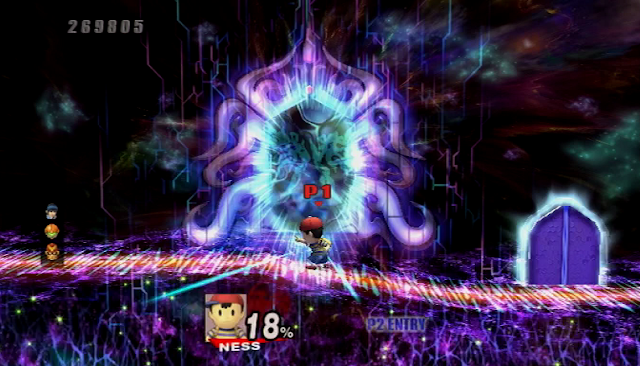 Ness has arrived to save the day. It's weird how Ness is the mature, fearless one here while Lucas is a feckless lad. 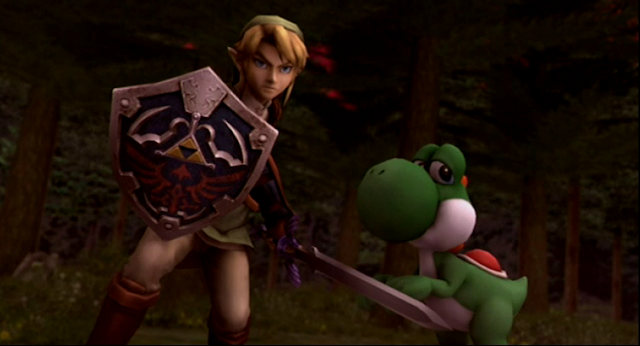 I feel like in their actual games, they both started as scared kids and they both matured into fearless battlers. Heavily-Armed Pokey attacks! Sans the heavy metal music, unfortunately. This is probably the most I've been into this story mode yet. It's a legit boss fight with a foe that you A) Can't play as and B) Haven't fought a bunch of times already in other games/modes. Pokey is defeated, but things go south when Wario appears with a BFG of his own and turns Ness into a statue. Rain patters down on the apocalyptic hell-scape as Lucas runs for his life, looking back to see Wario cackling. Man, this frightened Lucas is depressing. But wait! Pokémon Trainer is here. Wait, what? 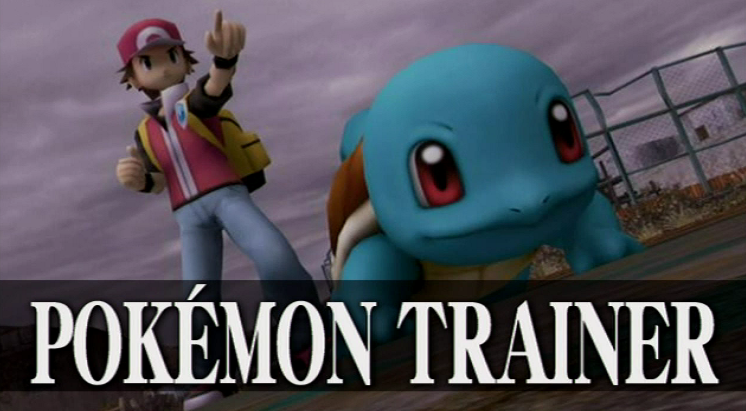 Pokémon Trainer? They're not calling him Ash? Back by popular demand: The Squirtle Dance. 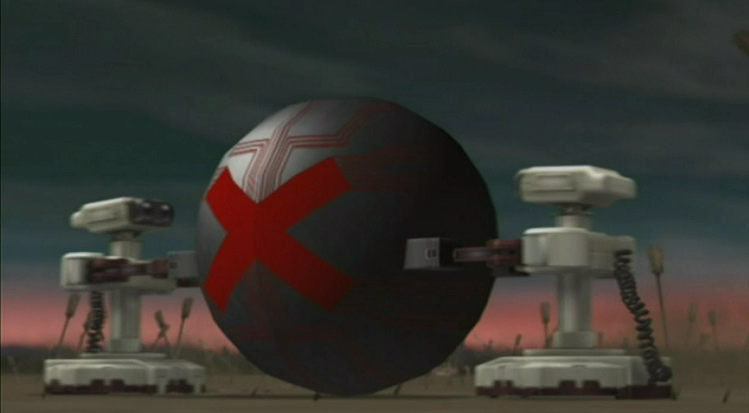 Some vile Rob the Robots show up with a nuke. It turns out that Skynet was an NES Punk all along. 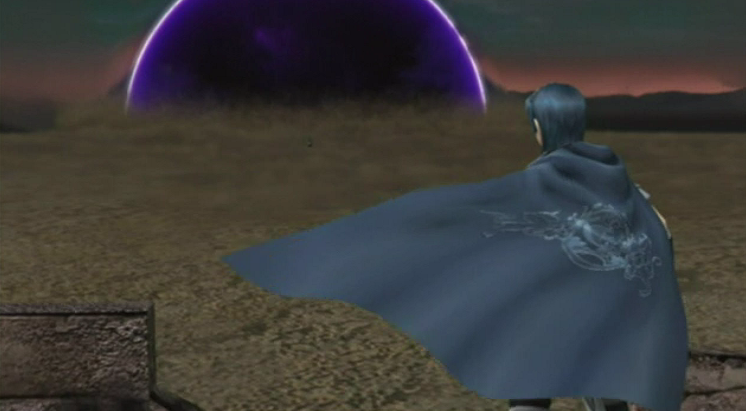 Great shot of Marth looking at another antimatter blast from a safe distance. 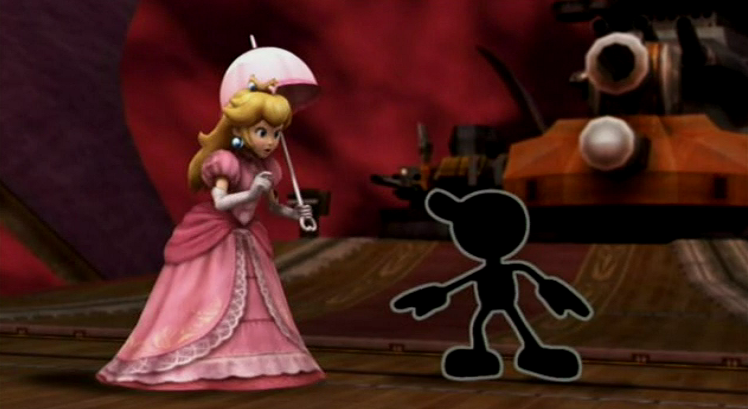 These are dark times in Nintendoland. What follows is a fairly lengthy stage where Marth chases lightsaber-wielding puppets from his castle. Meta-Knight shows up to battle Marth, but then they discover that they're on the same side against the nefarious puppet army. 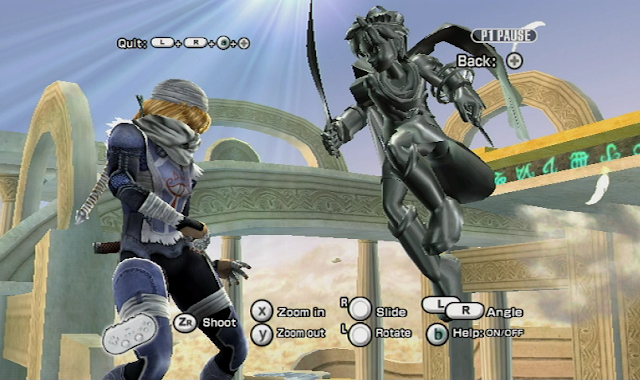 Also, Ike is here. This is like the one time in the game so far where the good guys have stood tall after an encounter with the...wait, what are the villains, anyway? 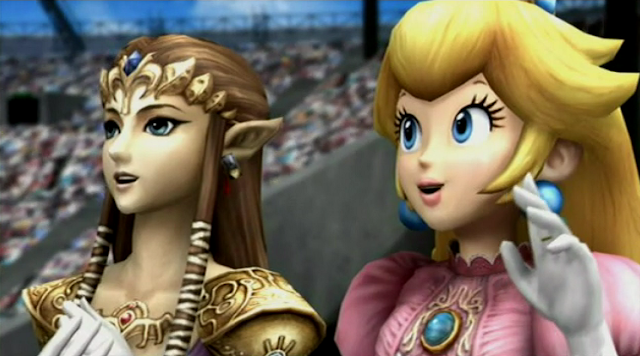 They're from Subspace, I think. Which is some evil sub-dimension of their dimensions. 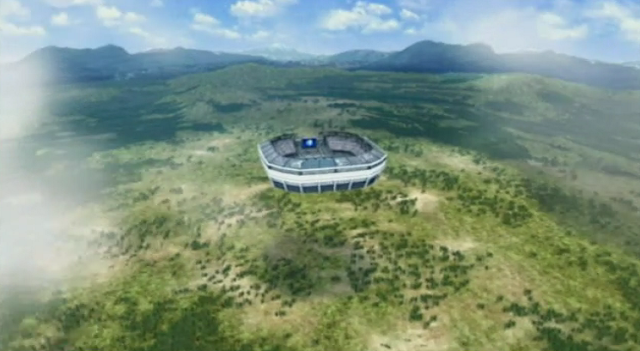 Maybe it's the place from Super Mario Bros 2. Oh man. 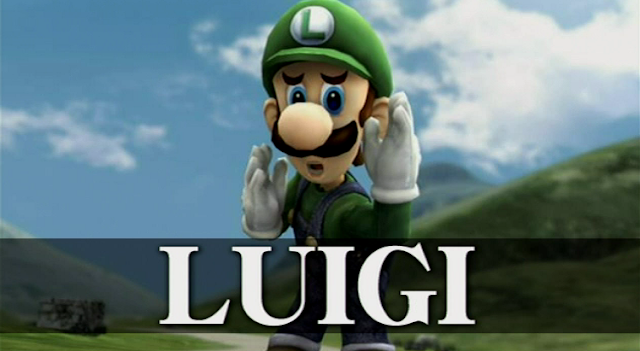 They Lucas'd Luigi. He's totally inept and wimpy now. King Dedede becomes the third Big Bad to run around BFGing heroes into statues. 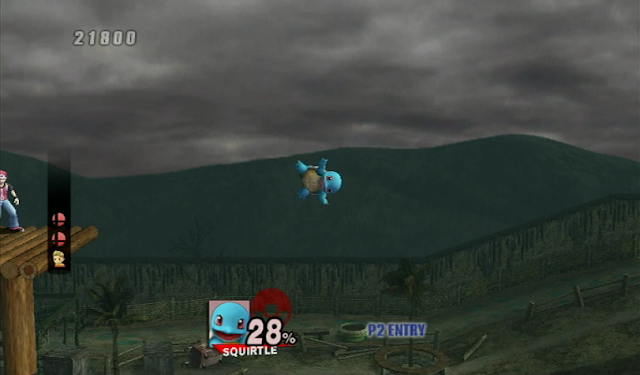 Now we've got Bowser, Wario, and this guy all running around wreaking havoc. If this tells me one thing, it's that Nintendo has something against big dudes. After Luigi's short-lived cameo, the latest cross-series team-up is Link and a visibly-baked Yoshi. 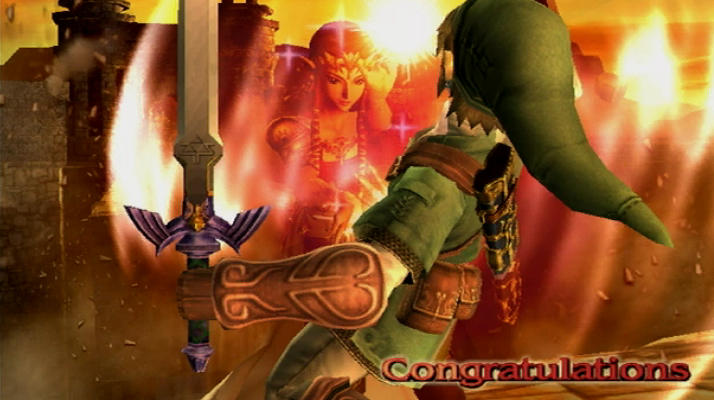 Link's sword-stabs are as fun to do as ever. 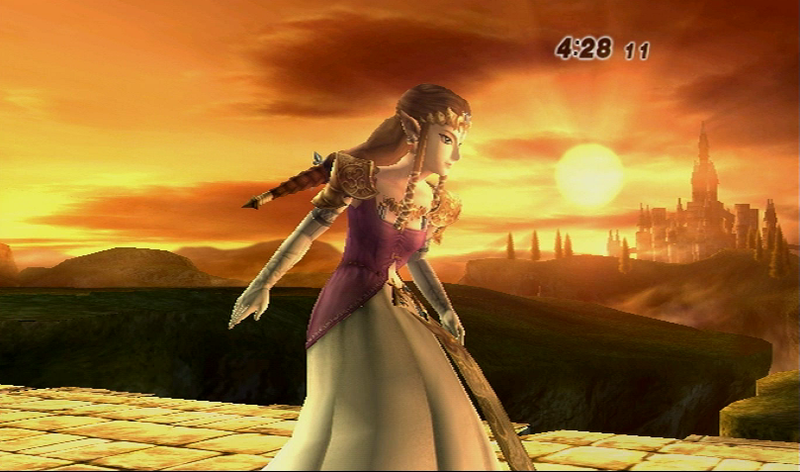 I think I would have liked Twilight Princess more if it had resembled this landscape. 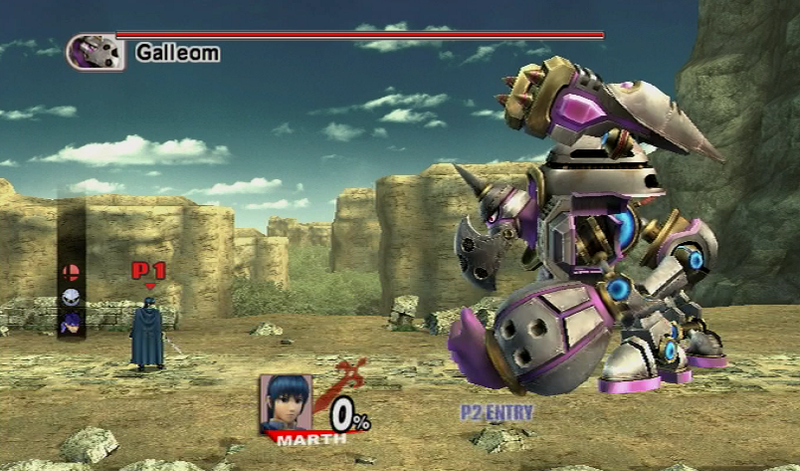 The entire game was this weird golden-brown color, like it got toasted in a waffle iron. 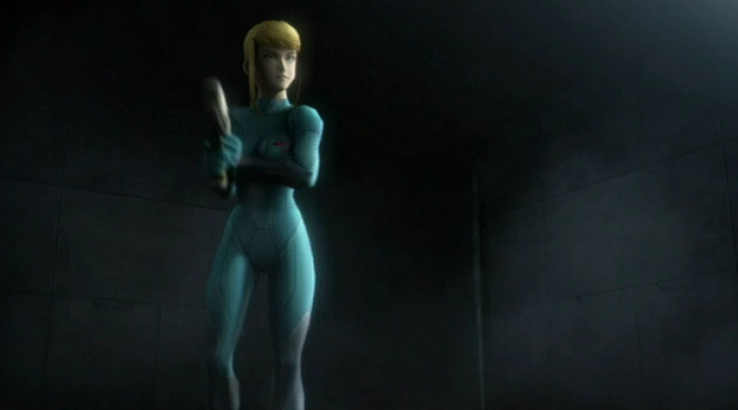 Here's Zero Suit Samus, finally making her Smash debut. I'll maintain forever that her look in Super Metroid should have been canon. 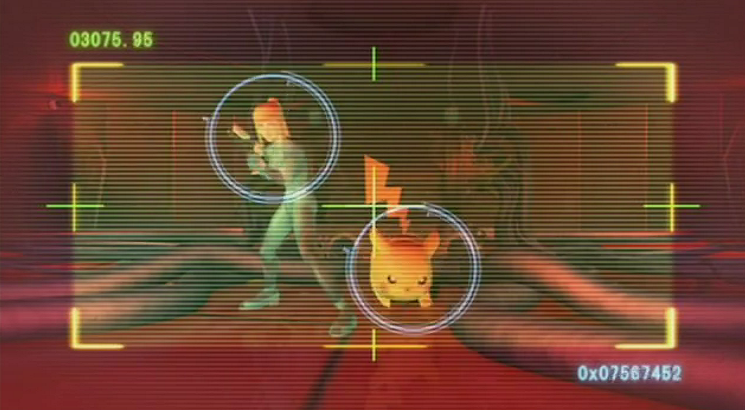 She teams up with Pikachu to fight off bloodthirsty Rob the Robots. 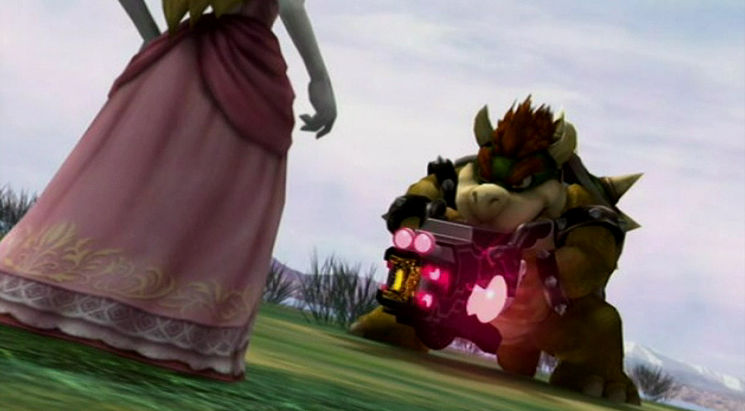 Meanwhile, Bowser zaps Princess Toadstool with the BFG. What? Isn't he infatuated with her? Why would he do this? 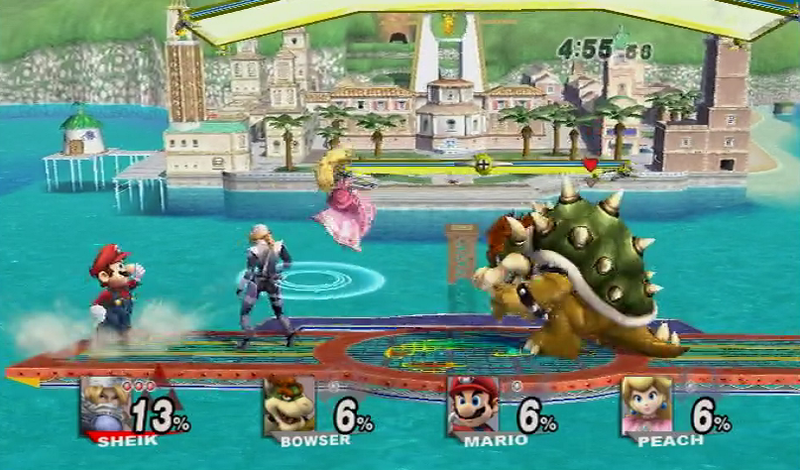 WHY BOWSER WHY? Not sure what game this thing is from. Kirby's Super Star is my first guess. 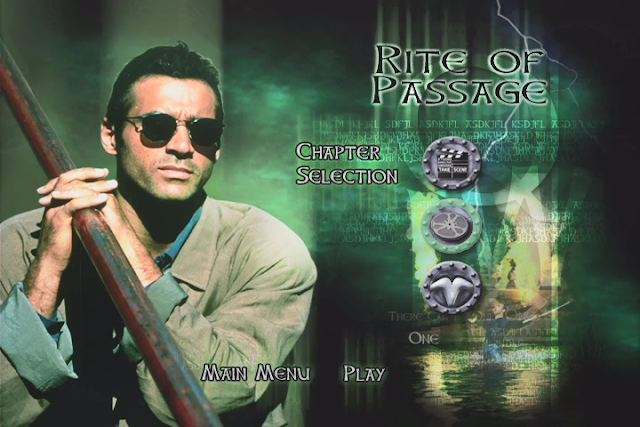 Some Google-fu tells me that it's actually a new creation for this game, surprisingly. 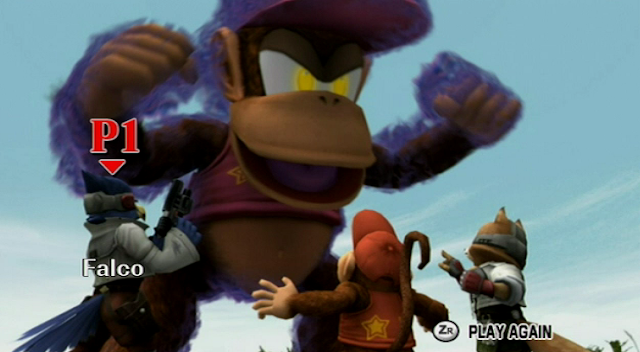 An evil Diddy confronts the good guys next. Of course, he's giant. It seems that the Subspace villains can create "shadow versions" of our heroes, maybe with all the life-force they've been draining from people via BFG. The story is weird. There's even a shadow Samus (not Dark Samus), as the real Samus shows pretty intense sideboob. 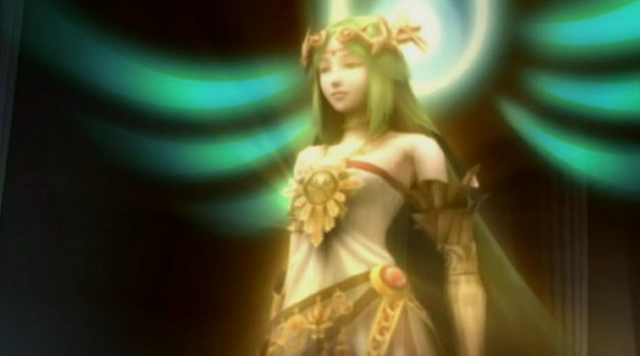 Between this shot and Palutena, it's safe to say Nintendo caused a fair amount of young men to go through puberty. 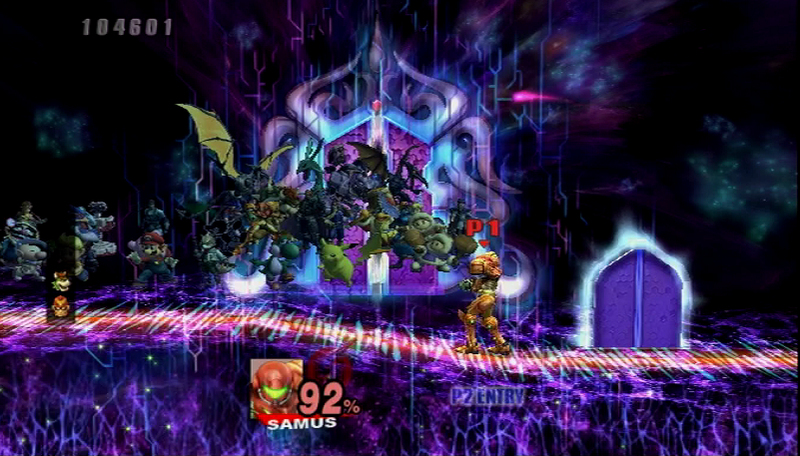 Samus puts on the suit in time to battle Ridley. 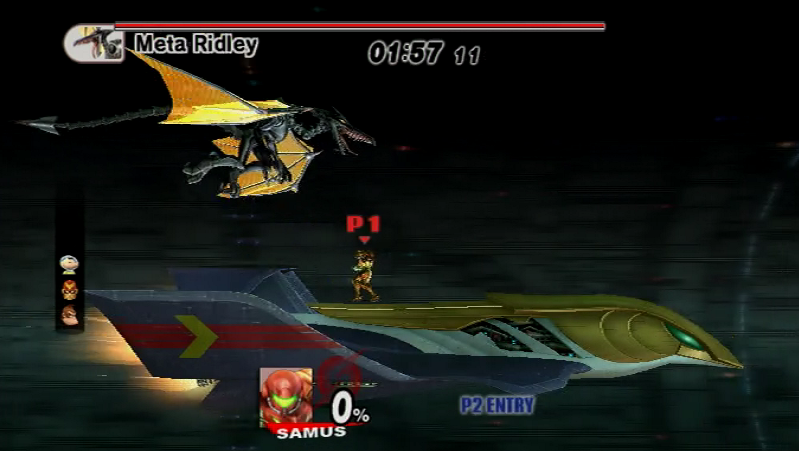 This is OG Ridley, not the Meta-Ridley most people know him as. I think that'll come later. 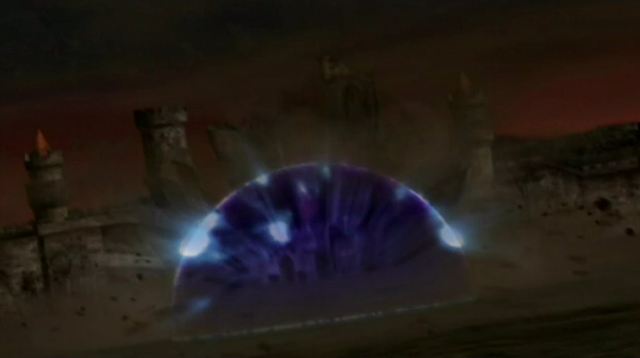 This might be the first 3D rendition of Ridley's first form, seen only in the original Metroid. This...is what the screenshot button is for. 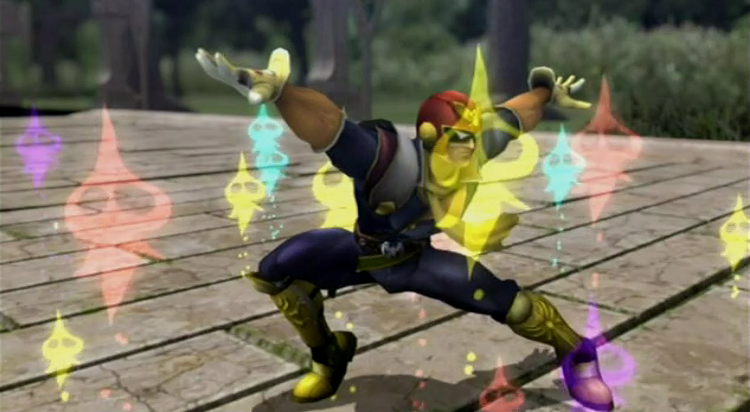 The next stage revolves around Captain Falcon, one of the most OP characters in this game. Half of his moves are ring-outs, and he poses gracefully like a gazelle. 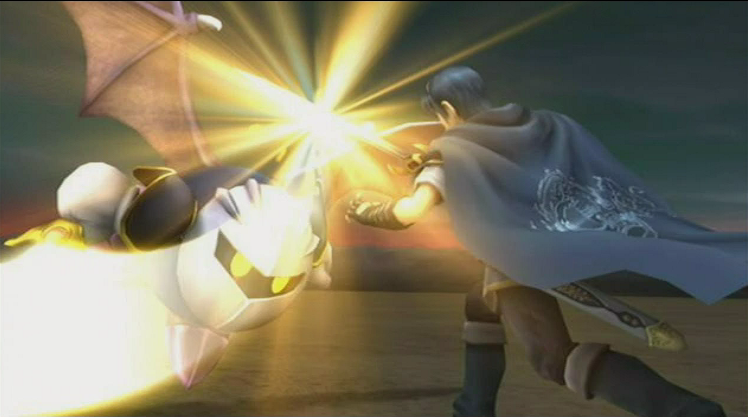 Meta-Knight's Dreadnought rampages a lot during this story mode. 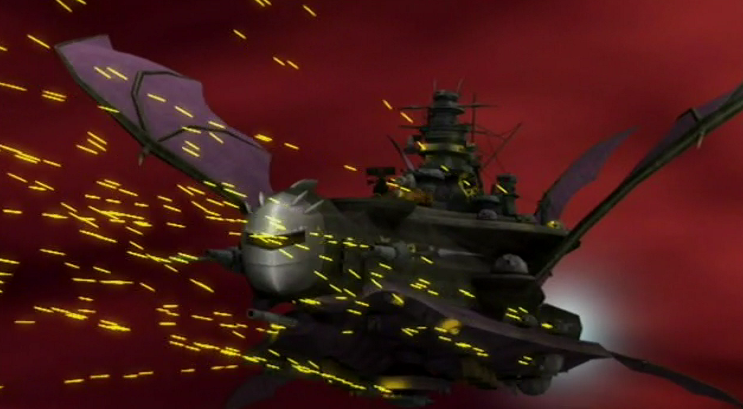 What does it need all of those guns for? 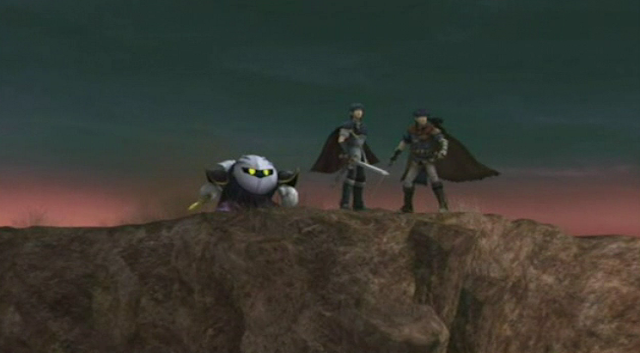 Note: Meta-Knight is indeed a good guy at this point, which means someone else is flying this thing. Likely whoever is behind the Subspace invasion. 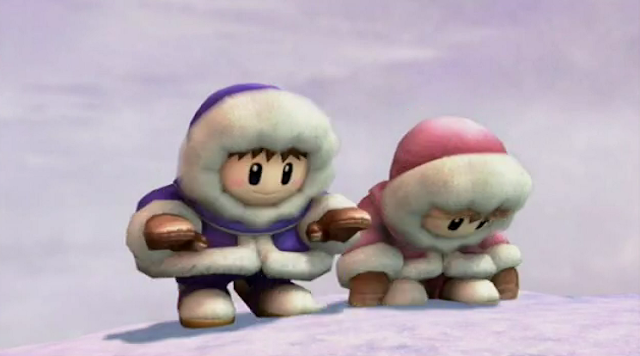 Moving on, it's the Ice Climbers. AKA the Nintendo mascots that no one played the source material for. That aside, the good guys gradually form into a cohesive force, with the objective of rescuing their brethren who got turned into statues already. 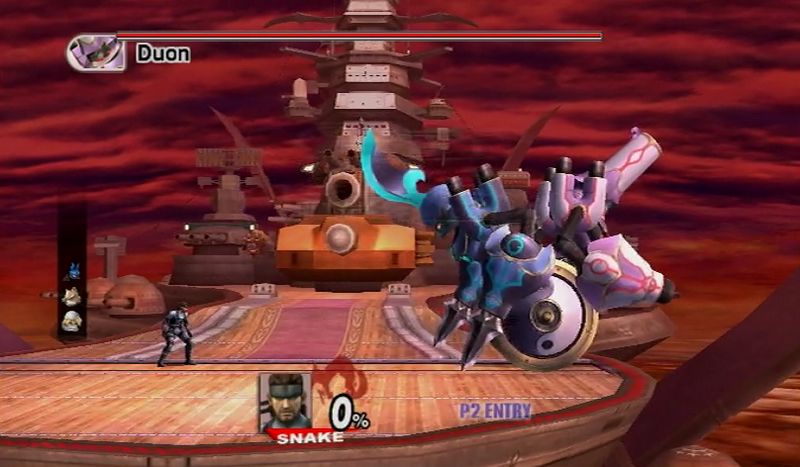 Solid Snake makes his Smash debut, infiltrating Meta-Knight's Dreadnought. THIS...is awesome. It's also probably more like Metal Gear Solid than that weird upcoming zombie game is going to be. 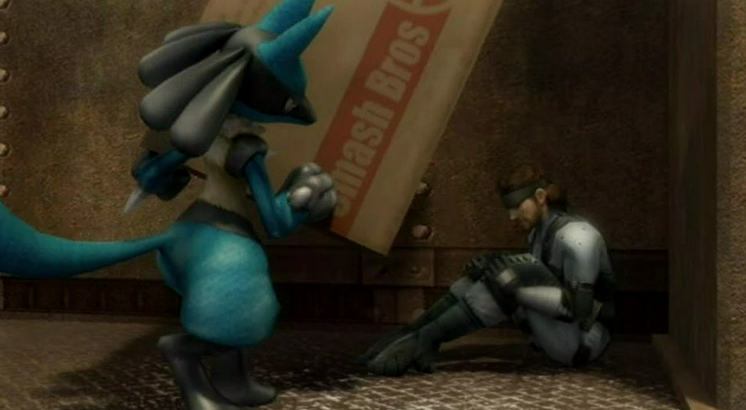 He even hides under a box, only to be spotted by Lucario. 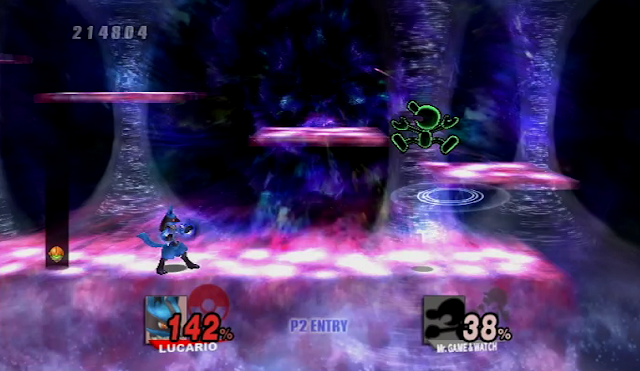 Nothing gets past Lucario! He's the ninja master of Pokémon. ...this game is scene after scene that I never thought I'd ever see back in the 90's. 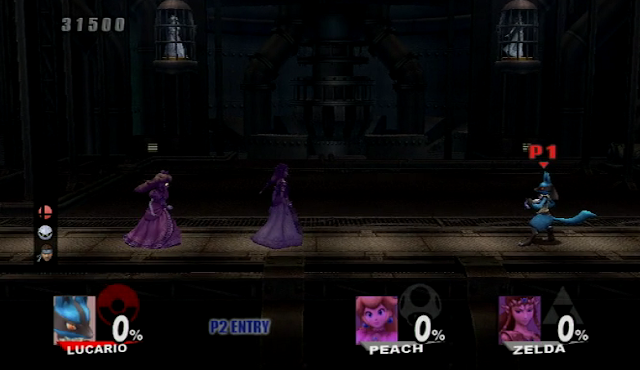 Lucario gets double-teamed by the shadow forms of Princesses Peach and Zelda. "They never let us do that!" gasped Mario and Link when reached for comment. 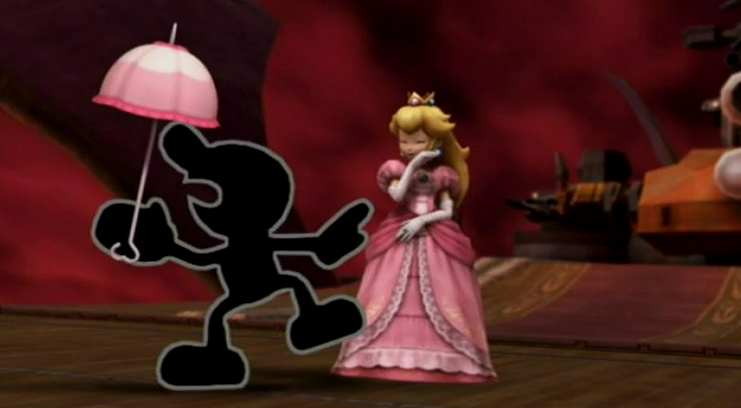 ...a face-off between the newly-unstatued Peach and the notorious Mr. Game-and-Watch. I...I don't know what's happening. 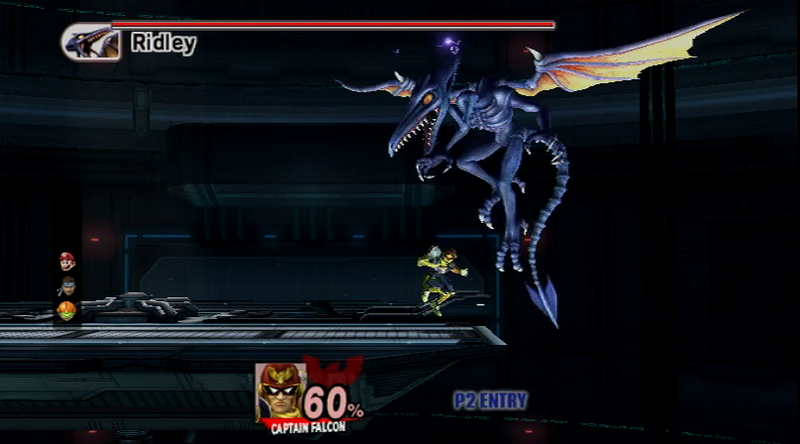 Another clash of worlds occurs, as Samus battles Meta-Ridley on Capton Falcon's Blue Falcon ship. 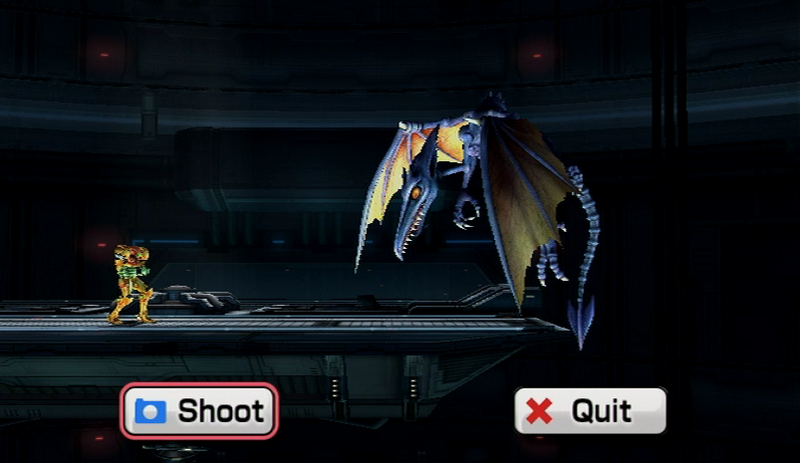 Meta-Ridley is much more formidable than standard Ridley, sporting new mechanical enhancements. A true bio-mechanical menace, much like the Xenomorph of the original Alien (before they became bugs). Atop the Dreadnought, we see the Powers That Be behind all the trouble. 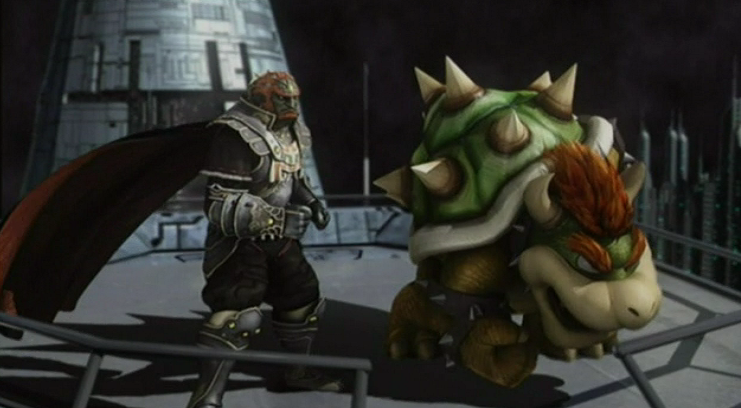 Bowser and Ganon have teamed up in a Two-Man Power Trip for the ages. 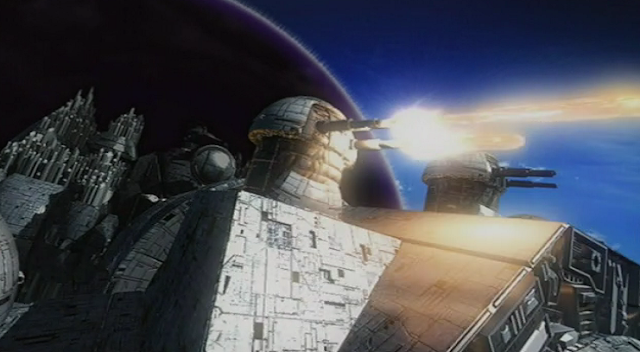 Things then get Star Warsy Outta Nowhere with laser turrets and stuff. I finally arrive in Subspace, and it's indeed a weird dimension. Doesn't look like Super Mario Bros 2. 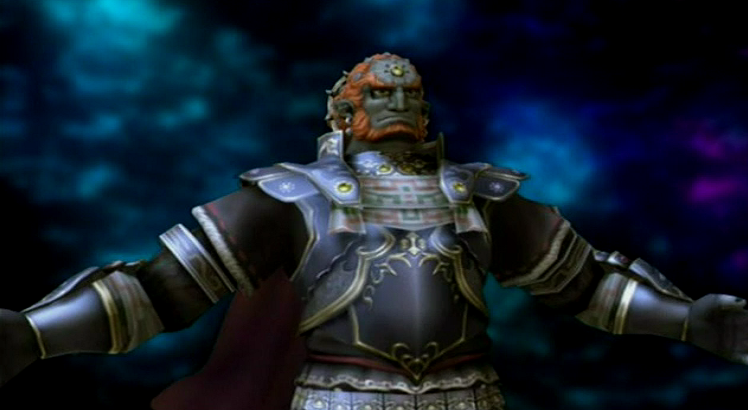 I'm glossing over the story to avoid spoilers, but suffice to say, Ganondorf is the Big Bad at this point. 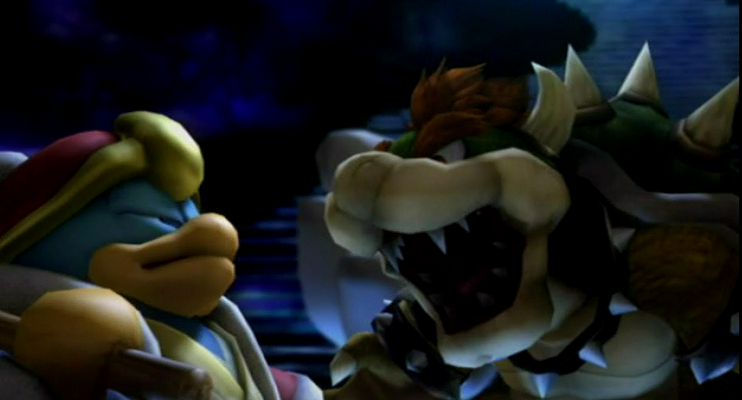 He betrays Bowser (who betrayed King Dedede already). 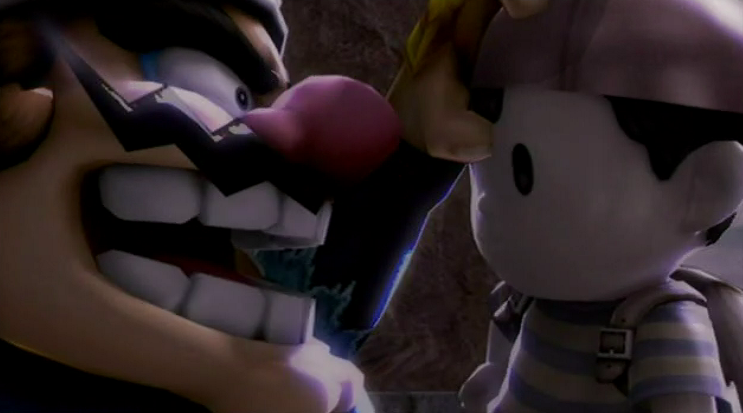 I think someone betrayed Wario too. Then Ganondorf finds out that the evil force giving HIM orders is...evil, and betrays...himself. It's also worth noting that he bears a strong resemblance to a young Jake Gyllenhaal. Okay, I'll go ahead and explain further. The evil force behind everything is Tabuu (who?) 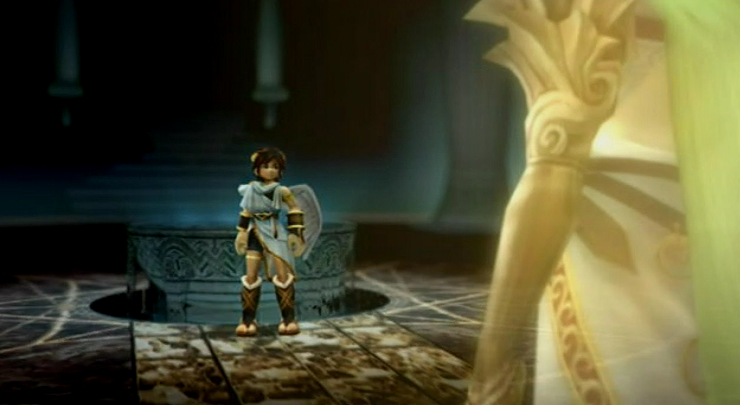 and Ganondorf is killed trying to stop him when he realizes his folly. Wait a minute...his goal is to turn everyone into bite-sized statues...and his name has "Buu" in it...COINCIDENCE? 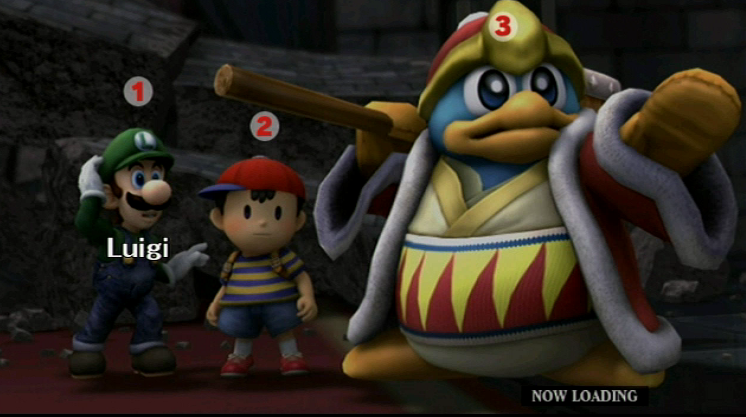 At least King Dedede survives long enough to turn good. 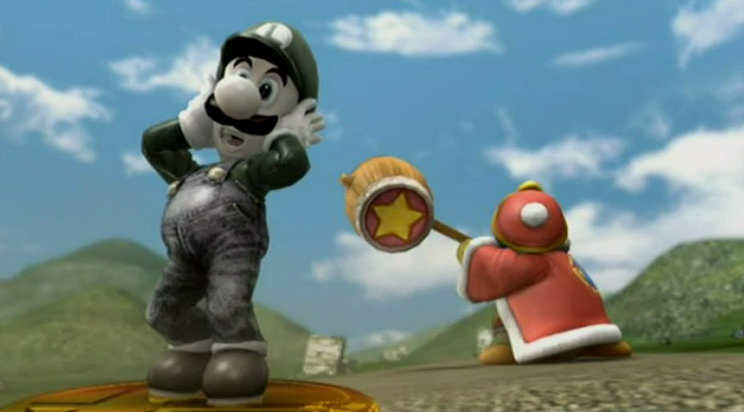 Luigi is back in action too, but from the looks of things he's going to last about one minute. 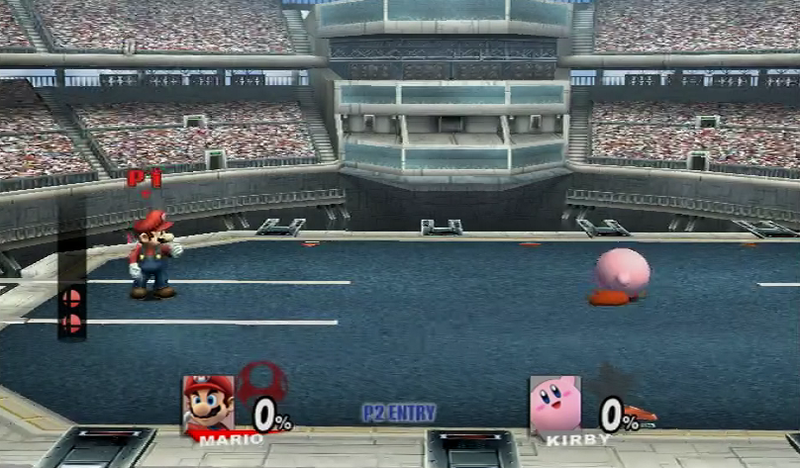 Dedede Vs. Bowser is a smash-mouth slugfest between two tyrants of the ring! And finally, we come to the last "dungeon": The Maze. This is the real meat of story mode, and even though it's the last level, it's almost as long as the rest of Subspace Emissary combined. When I reached this point, I thought I was just about done with the story. Nope. To put things in perspective...all of these figures are bosses that you have to defeat, shadow versions of the cast and reduxes of the bosses. They're all over the place in this massive maze. It's gonna take a while. 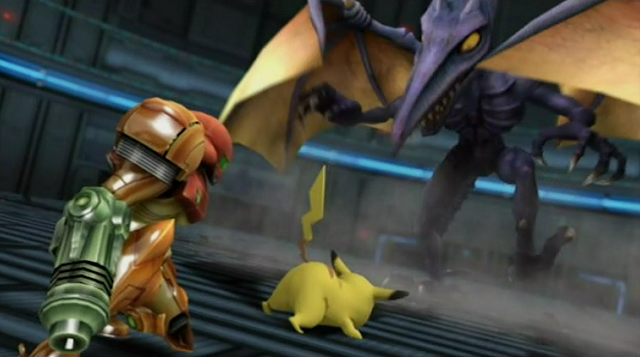 This means the return of Ridley, as well as Meta-Ridley. It's almost a boss rush, but you fight all of the hero characters too, and having to find them in the maze spaces the fights out. 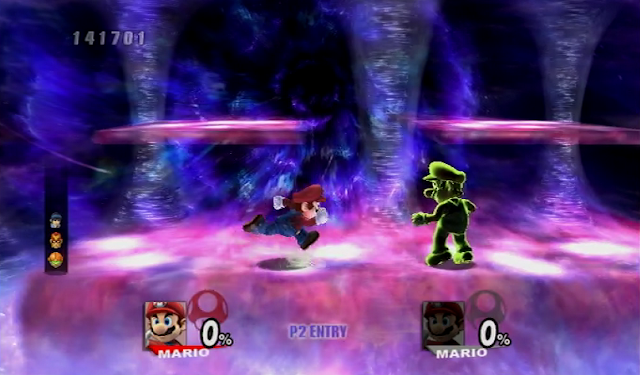 Mario Vs. Mario! 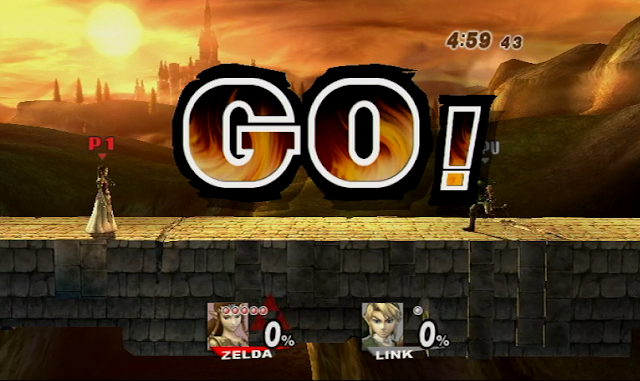 This is Nintendo intensity! THIS! 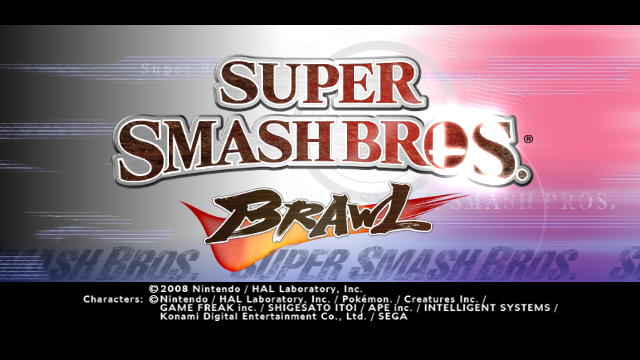 IS SMASH BROS! 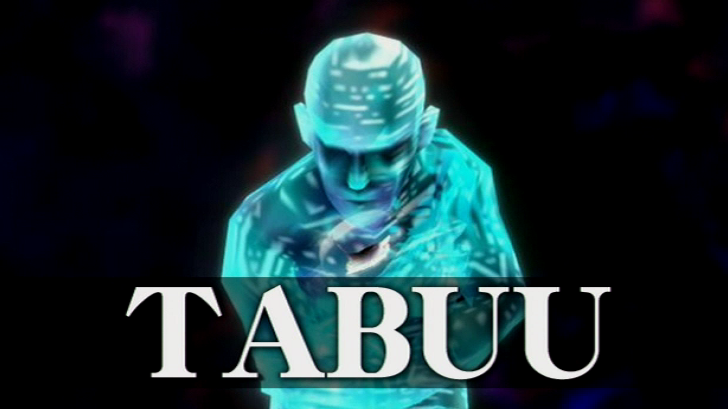 ...Tabuu. Seriously, WTF is this guy? 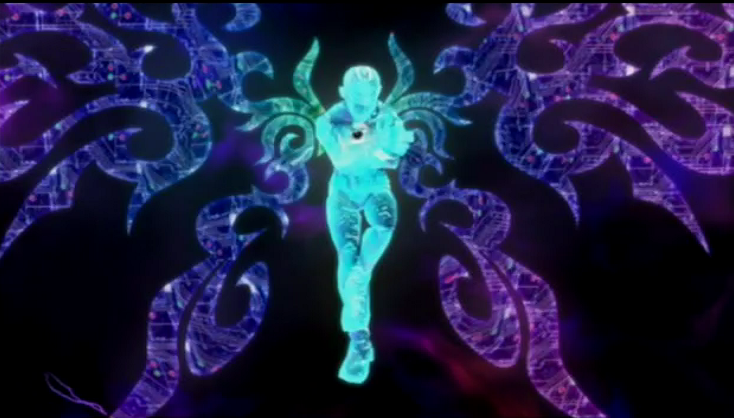 Is he supposed to be the Big Bad of all Nintendo universes? 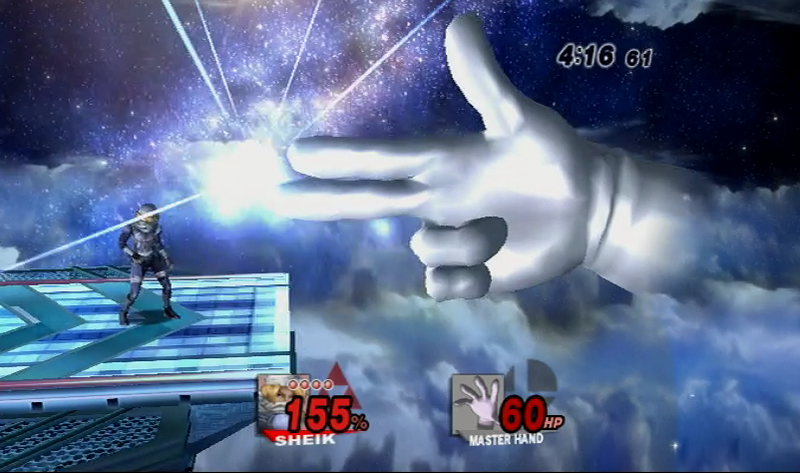 The higher power behind even Master Hand? Why doesn't he appear in any other games? He's a weird hologram-ish creature, kinda like a Rez refugee. He's also EXTREMELY difficult to defeat, at least for me. 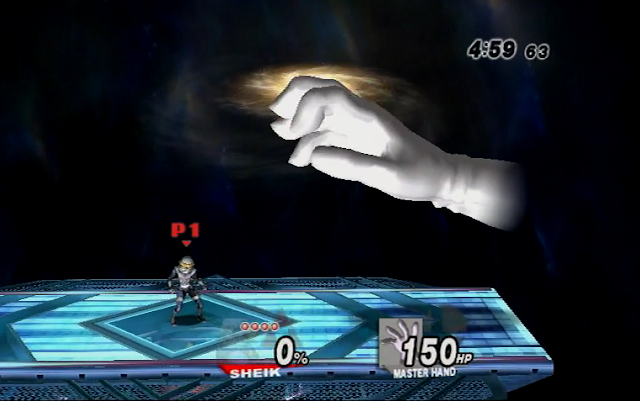 Makes Master Hand look like a total joke. This took a bunch of tries, even with five characters at my disposal. The good news is that you can choose which characters to take with you for this battle. The anti-matter waves all disappear from the world, and everything goes back to normal. Tabuu and Subspace are no more. Now...our heroes are free to play the game and beat each other up in multiplayer matches as the Lord intended. Lyn in Fire Emblem Warriors or we riot! If only Kano and Sonya helped you fight Shao Khan. Hell, I'd take the help for Kintaro. Wow, I had no idea Pokey was in this, particularly the heavily armed version. 3D OG Ridley is pretty cool. 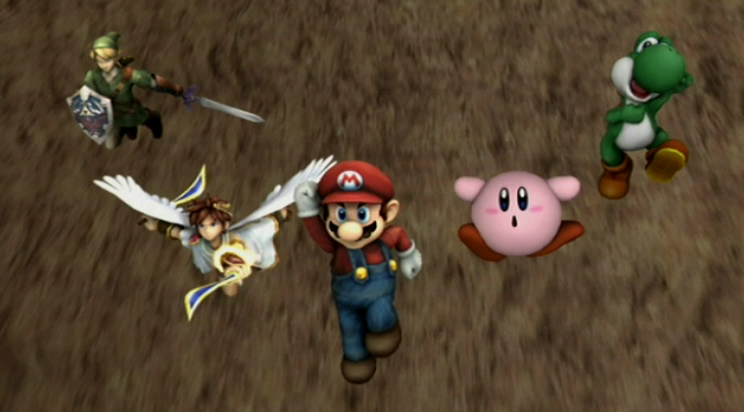 Super Smash Bros is the best game. Love it!